Trick up your Easter with these great recipes from some of our South Australian brands. 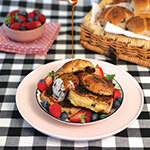 Is there a better way to kick off a long weekend than with Kytons Hot Cross Bun French Toast? 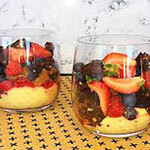 This recipe was created by Adelady especially for Kytons Bakery. 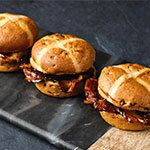 Or maybe this for brunch – Citrus Maple Bacon Hot Cross Bun Sliders made with Lifestyle Bakery’s gluten free hot cross buns. But it’s ok if the kids aren’t into hot cross buns – why not get them in the kitchen to make their own MOO Yoghurt’s Yoghurt Oat Muffins! 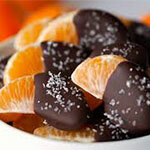 Serve Costa’s Salted Chocolate Dipped Mandarin Slices with coffee or pop a few in a cellophane bag to celebrate the season’s citrus and make someone very, very happy! 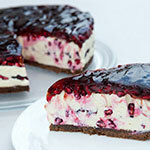 Jolanda Dalzotto created this Pomegranate Cheesecake for RivPom Pomegranates. 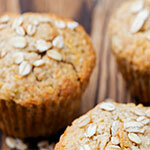 Celebrate these great little flavour bombs with flair. It’s got an Aussie flavour twist and it’s super easy – it’s G-Fresh’s Deconstructed Chocolate Glass of Goodness.